Want to show your photos to your friends and family and today’s and tomorrow’s clients? Then it off pays to have your own Internet photo presentation. Especially if that presentation has a clean and vibrant look. Do you know free online photo galery with unlimited acces? Access to the Zonerama photo galleries is integrated into Zoner Photo Studio as well as our Android app, so you can upload to Zonerama from either of them. 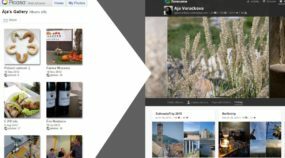 In this article we’ll take a look at how to share photos on Zonerama from inside of Zoner Photo Studio, our universal photo software. Open Zoner Photo Studio (ZPS) and make sure that you are in the Manager. Then also make sure that you are in the Browser view, and then in the Navigator—the column on the left with a list of places—choose Zonerama. Go to the Manager’s Browser view, and then in the “Navigator” list on the left, click Zonerama. If you are not logged in to your Zoner Account, ZPS invites you to do so via a blue text here. Use the same e-mail and password that you use for Zonerama. 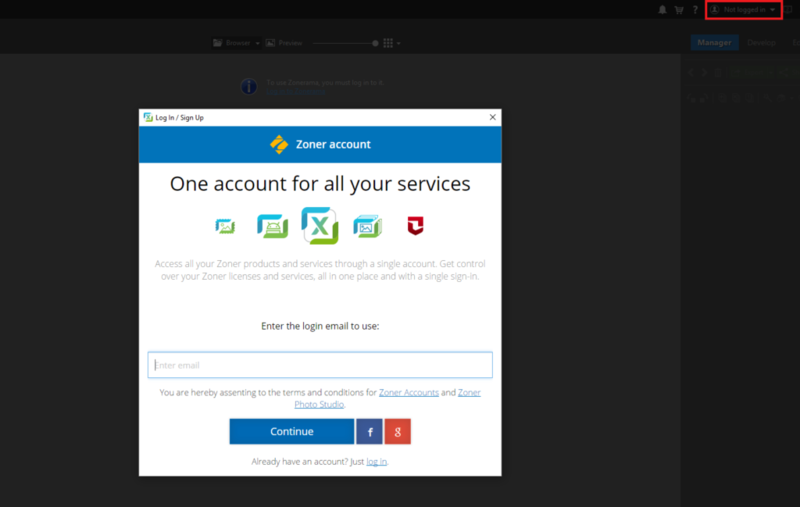 If you’re new to Zonerama, then use your Zoner Account login details here. (To create a Zoner Account if you haven’t already, go to account.zoner.com. If you purchased Zoner Photo Studio before having an account, then an account was created for you automatically—check your email for the password.) This displays a Browser with one folder showing. That folder is your gallery overall. Open it to see other folders. Every new user of Zoner Photo Studio automatically gets a Zoner Account. Logging in to your Zoner Account also logs you in to Zonerama. When logging in to Zonerama for the first time, all you see here are the automatically-created Hidden Albums and Public Albums folders. These “folders” are different from classical folders on your computer. They’re a single level of organization, with just one more level, called “albums,” below them. They help you maintain order in your Zonerama albums. Folders also determine whether or not the albums inside them are visible for everyone, or just certain people, and how visible they will be. But we’ll cover that in more detail below. These “folders” can be renamed. Click a folder and press F2 to rename it. To create a complete new folder, press F7. Name it however you wish—for example Family or Jobs. You can create albums within these self-created folders too. Here again, press F7 to create an album. When you log in to Zonerama, one folder—containing the whole gallery—appears in the Browser. The Zonerama “folders” are beneath this. Every new Zonerama account starts out with two: Hidden Folders and Public Folders. You can create more. Upload the photos into your albums via drag-and-drop. One very practical method is to open two Browsers in ZPS. To do that, use the “View” menu’s “Two Browsers, Stacked” or “Two Browsers, Side by Side” item. 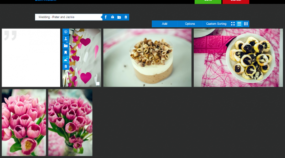 To easily upload photos to Zonerama, drag and drop them from one Browser pane to the other. To show two Browsers, use the View menu, or click one of the blue icons at the top left above the photo listing. 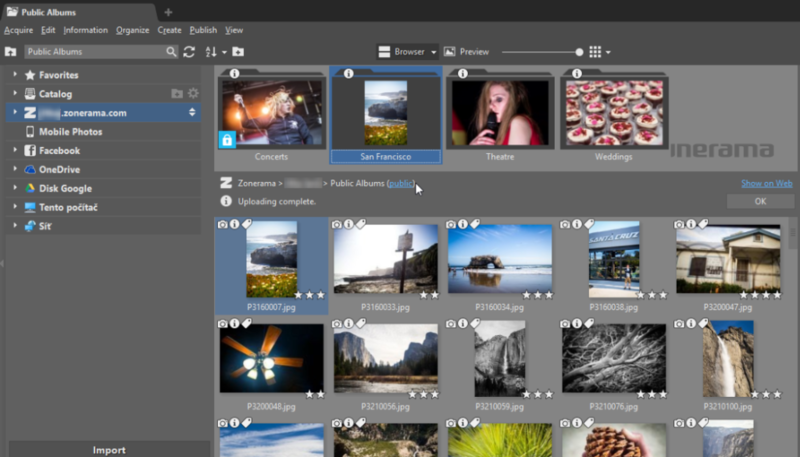 Zoner Photo Studio makes it easy for you to drag and drop one or more photos into your album. Note that you cannot upload folders, or non-photographic formats like GIF. Large and small? One advantage of Zonerama is that you can upload your photos as originals, at their full, large resolution. Also, Zonerama does not shrink or compress your photos in any way, and so you can later download them from Zonerama onto your computer as a way to recover e.g. accidentally changed or deleted photos. 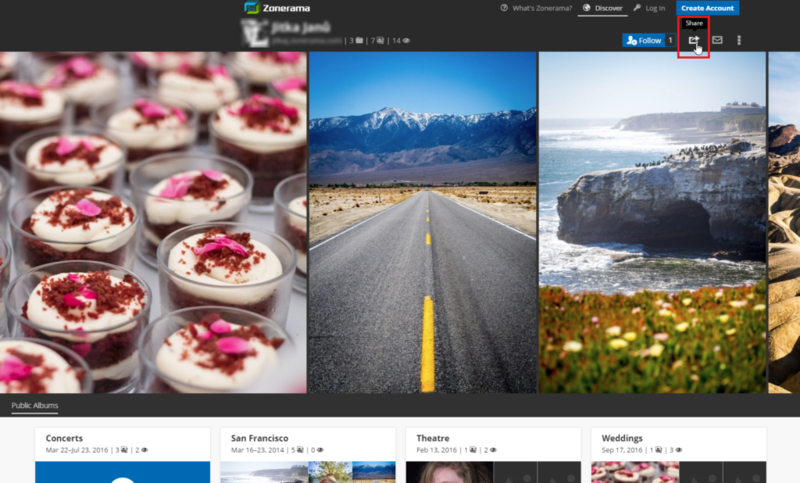 However, Zonerama is primarily a way to present your photos. It is not a backup service. For presentation, it’s generally enough to use a smaller resolution for your photos—you can decide based on e.g. the resolution of a Full HD monitor. These are generally 1920 pixels wide. Uploading photos at a smaller resolution can make uploading many times faster—seconds instead of minutes. Tip: To easily batch-shrink your photos in ZPS, set up a Batch Filter (Edit menu > Batch Filter item, or Ctrl+Q) that for example shrinks the photos, watermarks them, and renames their files. To just resize a batch of photos, select them and use the Edit menu’s Resize… item, or press Ctrl+E. But make sure to always edit copies of your photos, not the originals. Always keep full-sized backups of your photos around! When you create a new album within the Hidden Albums folder, or any other folder with the Hidden property, it has a blue “eye” icon. The same applies when you create a hidden folder. The eye icon indicates that an album or folder is hidden from the public. Hidden albums on Zonerama are only visible in certain cases. You see them when you log in to your account. Others can see them when you send them a special link to your album. To create that link, click Share on Zonerama—read on for details. 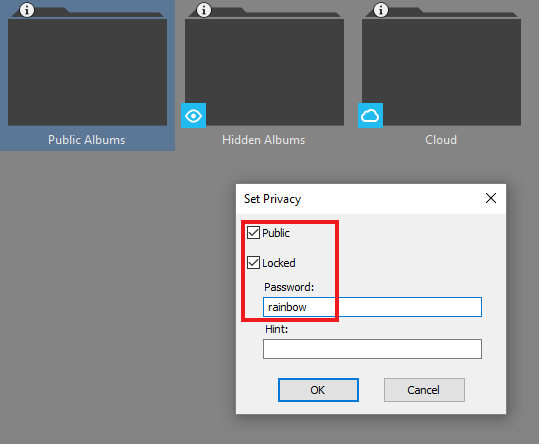 To make hidden photos public, right-click in ZPS on the hidden album or folder and use Set Privacy…. Then in the Set Privacy window, turn on Public. This makes the photos in the album or folder visible to everyone who finds your Zonerama gallery. You can set album privacy right from inside of Zoner Photo Studio. To make it visible to everyone that a given album exists on Zonerama while only enabling selected people to visit it, make it Public but also Locked. Then enter a password in the Password box. Either leave Hint empty, or enter a hint to help people remember the password. Your galleries can contain albums that are only viewable after entering the right password. On Zonerama, everyone but you sees a lock icon on locked albums. Upon mousing over a locked album, the lock is replaced with a box for entering the password. So the photos in these albums are only viewable by people who know the password. In public folders, you can have locked and unlocked albums side by side. 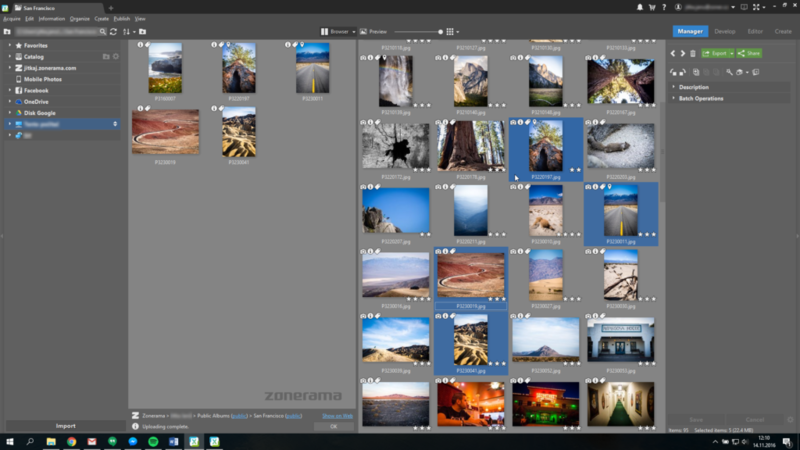 Tip: You can rename or delete a Zonerama photo directly from inside of ZPS. You can also edit a photo in the Editor when you’re browsing your Zonerama galleries inside of ZPS. To do so, right-click the photo and use the “Editor” item. Edit the photo as needed, and use Ctrl+S to save it when you’re done. In ZPS, visit the folder containing the album to share. Click the blue Show on Web link at the bottom right. This opens a Web browser window with the Zonerama page. Click Share at the page’s top right. The Share button is at the top right of the Zonerama page, above the photo previews. Every user with at least one public album is on the public list of Zonerama users. Everyone, including users who aren’t registered or aren’t logged in, can reach public galleries on Zonerama by gallery name, person, album name, or the direct, unique address for a gallery’s main page (e.g. john.zonerama.com). Caution: If all of your Zonerama albums are hidden, then no cover slideshow can be shown above your albums on your gallery’s main page, and your albums also are not shown among public albums or showcased among Zonerama’s latest albums. Likewise, your profile cannot be found in searches. 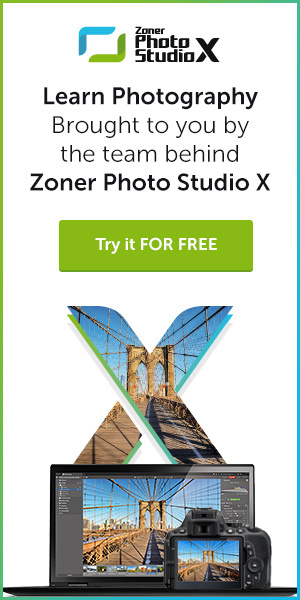 Download Zoner Photo Studio, use it free for 30 days and start to share your nicest picture with the world on free Zonerama galleries. Tip: If you have questions about ZPS or Zonerama, join the discussion below this article, take a look at the Frequently Asked Questions (FAQ), or write to our support team: support@zoner.com. Is There Life After Picasa?